At the beginning, the first bands were formed by a flute, violin and guitar trio, and by the late XIX century, the bandoneón was incorporated. Nevertheless, reality would prevail and improvisations were made with the musicians and instruments that could be found and kept. Thus, harpists, mandolin or piston players would join the associations that would experiment a constant change. The first records of a band date back from 1870 and it was made up by Sinforoso in the clarinet and Casimiro Alcorta in the violin. Even if by 1900, the quartets and quintets began to emerge, the duets did not disappear and, with the passing of time, they regruped into the typical orchestras. These groups became all the rage in the towns. This name is attributed to Vicente Greco, director of one of the most famous bands from the early years. By 1911, the Tagini house hired Greco to make some recordings and thus spread the incipient phonographic industry. 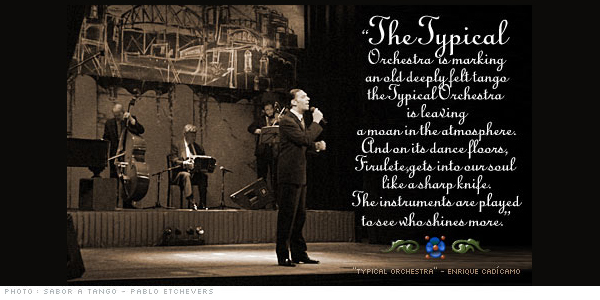 In order to distinguish it from the formations that, in addition to tango, would also perform pasodobles, tarantelas, mazurcas, polcas and waltz, Greco resolved to call its band "Orquesta Típica Criolla" (Typically Creole Orchestra). Greco would identify the native music with this namem, and the denomination of typical orchestra is used nowadays for those bands that perform only tango. The figure of the singer with an orchestra had important representatives, such as Ignacio Corsini and Agustín Magaldi; and Tita Merello, Azucena Maizani, Ada Falcón, Rosita Quiroga and Nelly Omar, among the women. After the 1930s crisis, which also had influenced on the tango, Juan D'Arienzo's orchestra gradually regained its importance late that decade as a result of its great success. "You may laugh, but it is thanks to it that we can eat" Troilo would comment whenever D'Arienzo's rhythmic and hasty style would be made fun of. As after every crisis, things may reemerge more strongly. The 1940s were the tango golden years. It was the time of Discépolo's, Manzi's and Expósito's poetry, of listening to Casal, Berón and Marin singing and Troilo's, Pugliese's, De Angelis' and Francini-Pontier's orchestras playing, which would have their own fans. It was the glow of the 1940s tango that printed the most inspired pages of the 50 thousand written tangos. Lyrics and Music: Enrique Cadícamo. to see who shines more. la la ra la, la ra lai ra.